A sunny day attracted ten Basset Hounds to this lovely part of Dorset. 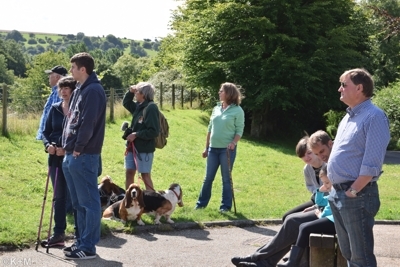 It was good to see some refugees from the Scottish Basset Hound Walkers - with whom we have corresponded - and to hear they enjoyed our walk. It was a gentle outing with no surprises, apart from most of the party bringing no lunch - banking on getting to the cream tea place before starvation set in I suppose. A gamekeeper stopped us at Minterne Parva warning us to keep our hounds on a lead, as "the pheasants were out." As if our Bassets would chase anything so flighty as that. Abbotts tea rooms served up some good cream teas to round off a very pleasant day.